A Chinese delegation with representatives from two companies connected to livestock production in China visited recently the Norwegian Veterinary Institute (NVI). The aim was to get a better knowledge about the animal health in Norway and hear how the institute contributes to prevent, detect and respond on emerging diseases that can have a big economic impact on the livestock industry. 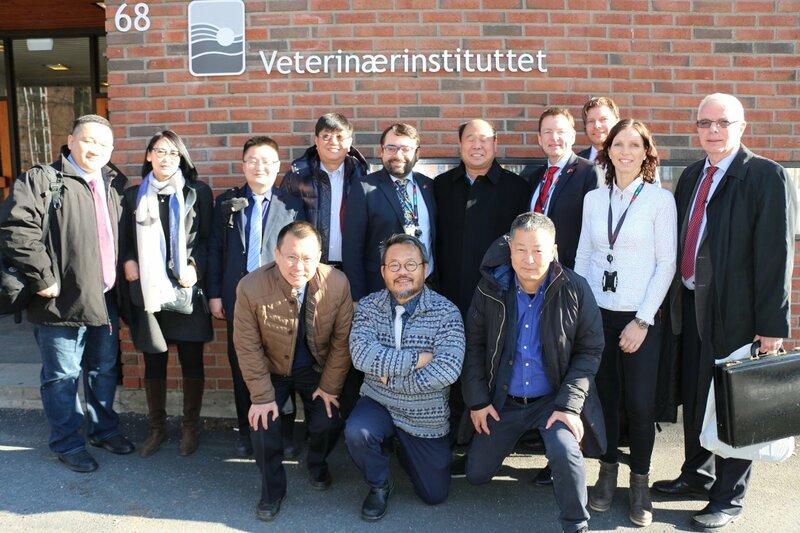 The Chinese delegation visited the Norwegian Veterinary Institute on the 11. March. Photo: Bryndis Holm. The companies that visited were Sunlong Livestock Development Co. and Sanyuan Breeding. Sunlong is a leading national dairy breeding and farming enterprise with five national and two Beijing-level scientific research and testing platforms. It is the main architect behind the dairy cattle breeding system in China, and has for a long time cooperated with the Norwegian company GENO. Gaute Lenvik, Director General at the NVI, welcomed the delegation and presented the institute and our efforts regarding ONE HEALTH. Researchers Thea Klem and Chiek Er presented the current animal health situation in Norway and gave an overview on the national surveillance and diagnostic programs for livestock. -The Chinese delegation was impressed by the good animal health situation in Norway and the huge effort taken by so many different actors to keep it so. There is a big difference between Norway and China when it comes to challanges regarding animal health, however it is important to share both knowledge and experiences with each other, especially when this can also support Norwegian companies when cooperating abroad, says Carlos das Neves, Director for Research and Internationalisation at the NVI.